Property 11: "HOME FROM HOME" from 200m to The Cathedral of Florence! Property 20: Your romantic terrace overlooking the cathedral dome. Property 32: PENTHOUSE HILIFE amazing panoramic terrace of Florence! 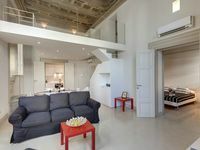 Property 35: Art Apartment Palazzo Vecchio - Wonderful terrace with amazing view. Property 38: - Luxury - Stunning Duomo view - Apartment 1033 Sq. Ft, Elevator Accessible. Best location, original Medieval tower! Property 46: Best location, original Medieval tower! Parione Apartment in the heart of Florence! Property 47: Parione Apartment in the heart of Florence! This was a fantastic home for our family of four. We Loved the terrace. We had lunch and dinner on the rooftop. Great location with lots of restaurants nearby and near the sites. Rita was fantastic helping us with recommendations as well as our laundry! It was fantastic! Mariaangela greeted us at the apartment and took her time to show us everything we needed to know. The apartment overlooks the piazza are had spectacular views. It was very clean and welcoming. The building itself is very old and charming. There was a great grocery just around the corner with reasonable prices. We really got a first hand experience of living in Florence. I would recommend this to families as we were very comfortable here. Thank you for the amazing experience.